She was just driving along, minding her own business, when the car started shaking. It got worse and worse. She got off the highway near home, and suddenly felt the car drop and a nasty scraping sound. 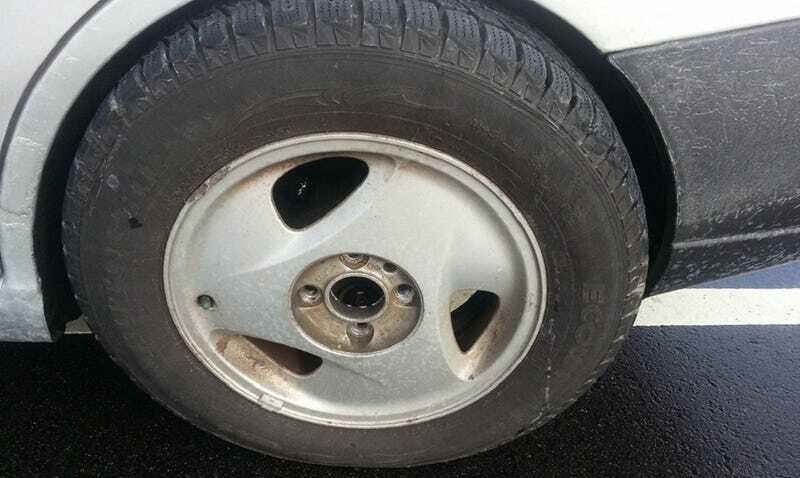 All four lug nuts on the left rear wheel had worked their way loose and terminated their employment with her Focus, taking the center cap with them. She got a tow home, where I zoomed up to take a look for myself. Her remaining lug nuts were pretty old, and the threads weren't as good as they should be. So we made a trip to the parts store, and at my recommendation we replaced ALL 16 lug nuts. My friend who sold her the car felt terrible, and assures us he torqued them three times before she took the car. Considering that the remaining lug nuts were, in fact, torqued properly before I removed them, I believe him. Still, it's cheap insurance to just replace them all. We took the car out to dinner and it drove fine. I retorqued the nuts when we got home anyway. I'll check yet again in a few days.